Can it really be that my sweet baby girl is 16? It doesn’t hardly seem possible. So much has gone on in these past sixteen years that time seems to have either slowed incredibly or sped up past the speed of light. All those years ago, this day seemed to terribly far away. But here we are. She is grown up. She is kind. She is beautiful. She is smart. She is fun. She is loved. She is all I could ever ask for in a daughter. She is sixteen. Her sixteenth birthday came just like any other birthday. It happens the very same day each single year. Isn’t that a coincidence? But this year, it arrived in the midst of one of the scariest, the craziest, the busiest, can’t hardly seem to catch our breath moments. Literally just days after moving from the home we’ve lived in since she was five, we celebrated her sixteenth in a new home. It was a crazy six days moving and unpacking and then trying to make the new house at least presentable to all the friends and family that would be partying with us the next weekend. Friday night the girls arrived and we began what would turn out to be a four day weekend of celebrating the Lovely Daughter. She had invited ten girls for a slumber party. When they arrived, we served them supper. The Lovely Daughter had requested the “Canadian Cheddar Cheese Soup” that she had had at Le Cellier in Walt Disney World this past summer. I purchased the recipe book and it was just as amazing from my kitchen as it was at EPCOT! I bought this recipe book specifically for the cheese soup recipe. Along with the cheese soup, she also wanted a chopped salad bar. I had seen The Pioneer Woman do one and we loved that idea. So we did it ourselves! For ours we had spinach leaves, romaine lettuce, butter lettuce, celery, mozzarella pearls, feta cheese, sunflower seeds, cherry tomatoes, diced chicken, cucumbers, black olives, green olives, garbanzo beans, bacon, boiled eggs, broccoli, green onion, red onion, radishes, mushrooms, yellow, orange, red and green peppers. Everything was cut into manageable sizes and then the girls, one at a time, chose their lettuce and toppings and dressing. I put it all in a large bowl and mixed it up then turned in out onto a cutting board and chopped away until everything was well mixed. Then I put it on a plate and they grabbed a bowl of soup and ate to their hearts content! It was so yummy. Such a fun thing to do for a girls party. Then they hung out downstairs for a while and we got the snacks out. Oh my. The snacks. The Lovely Daughter had requested her Grandma Maggie’s homemade caramel corn, mini cheesecakes topped with cherries, 7-layer Mexican dip (that I layered in individual cups), carrots with ranch, and beer bread with spinach dip. The birthday cupcakes came from J. Edwards here in town and they were AMAZING! They were “Chocolate Mousse Heaven” and yes, they were heaven! So light for a chocolate cake. 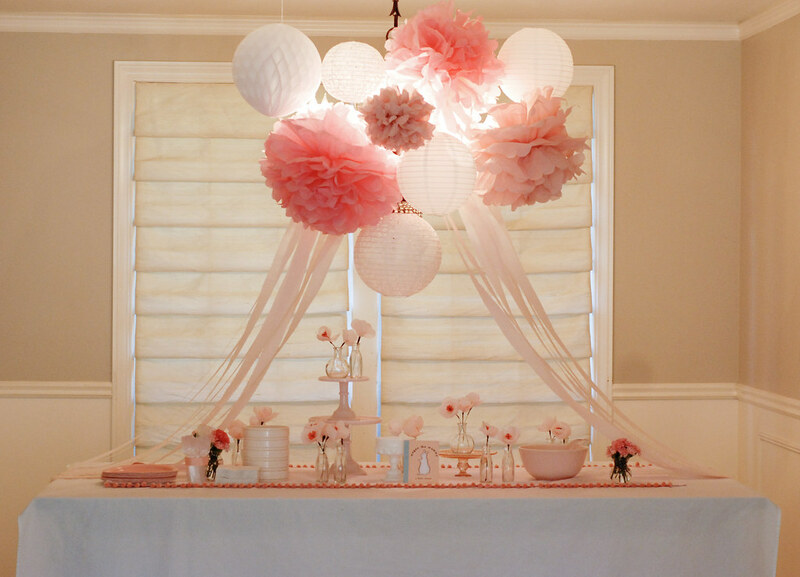 For the decorations, I bought some hanging lanterns and tulle for above the kitchen counter. I showed my sister a picture from Pinterest that was the inspiration for what I wanted and she just climbed up there on that counter and made it work! I had bought some black and white damask wrapping paper and used it as a “tablecloth” type thing then bought some purple scatters. I also bought purple gumballs and put them in a vase and since Lovely Daughter LOVES dark chocolate and since Hershey’s dark chocolate kisses come in PURPLE wrappers, I just couldn’t NOT buy some and put those in a jar for decoration also! Happy Happy! Yay for double duty decor. It matches and it’s edible! After the girls sang “happy birthday” we all grabbed some of those yummy snacks and headed downstairs for the gifts. THEN, they did a couple of crafts. Thanks to my Pinterest addiction, they each did a couple of glitter ornaments and then they made friendship bracelets and watched movies until the wee hours of the morning. In the morning, I made another Pioneer Woman recipe, Cinnamon Baked French Toast. I also served fresh fruit with yogurt, honey and granola. After a yummy breakfast, we all got ready to head to the Crystal Tea Room for afternoon tea. That was a fun experience for all the girls. Learning some table manners, etiquette, and trying lots of different hot teas. All in all, I would say that the party was a huge success. It was so much fun. All the girls! Love them! My sister helped with everything and even spent the night that night to help prepare everything and clean up and basically just help me not totally freak out with stress! I am sooooo thankful that not only is she my sister, but she’s also my best friend. Happy Sweet 16 Lovely Daughter!